1st Battery: Reporting from Brashear City (modern Morgan City), Louisiana with four 3-inch rifles. Under Captain George T. Hebard, the battery moved to Third Division, Nineteenth Corps in the reorganizations after the fall of Port Hudson. Initially assigned to Baton Rouge, the battery returned to Port Hudson in late July. During the first week of September, the battery participated in the unsuccessful Sabine Pass expedition. After that, they returned to Brashear City on garrison duties. 2nd Battery: At Port Hudson, Louisiana, with four 6-pdr (3.37-inch) rifles. Although using a column for bronze pieces, these were most certainly Sawyer rifles of cast steel. After the fall of Port Hudson, the battery remained at that place as part of the Fourth Division, Nineteenth Corps (again, a transfer as part of the corps’ reorganization). Captain Pythagoras E. Holcomb commanded the battery at the start of the summer. But on August 19, he was mustered out of the battery to accept a promotion to major in the 1st Texas (US) Cavalry. An interesting “unionist” story to follow. But as this is “To the Sound of the Guns” and not “The Tinking of Sabers,” I’ll leave that story to those who write about the cavalry. Lieutenant John W. Chase was promoted in October to replace Holcomb. 3rd Battery: Not listed. This battery began forming in November. So we will discuss them in the next quarter in more detail. Captain Romeo H. Start received commission in the battery on November 23. And was busy recruiting from that point forward. 1st Battery: 86 canister, 329 percussion shell, and 261 fuse shell for 3-inch rifles. 1st Battery: 130 shell for 3-inch rifles. 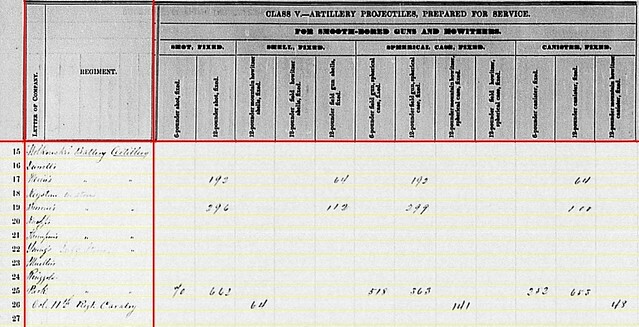 2nd Battery: 498 shell and 222 case for 3.67-inch rifles. 2nd Battery: 222 canister for 3.67-inch rifles. 1st Battery: Fourteen army revolvers and thirty-four horse artillery sabers. 2nd Battery: Seven army revolvers and fifty-one cavalry sabers. These two batteries continued their service in Louisiana into the next year. The 1st would muster out the following summer. But the 3rd, which we mentioned only as a prelude here, would move up to the front around the same time to participate in some of the most violent fighting of the war. Battery A: At Camp Barry, D.C. with four 12-pdr Napoleons. This battery was in the Artillery Camp of Instruction, Camp Barry. On September 3, George Furst was promoted to captain. Later in December the battery would return to the field. Battery B: At Beverly, (West) Virginia with six 10-pdr Parrotts. Captain John V. Keeper command this battery, supporting Averill’s Brigade, Department of West Virginia. Battery C: At Rappahannock Station, Virginia with six 10-pdr Parrotts (although a consolidated report from the Army of the Potomac, dated August 31, gives this battery four Parrotts). The “Pierpoint Battery” remained under Captain Wallace Hill. The battery remained in the Artillery Reserve, Army of the Potomac. 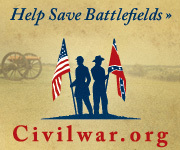 With reorganizations of the reserve, the battery moved from the Third Volunteer Brigade to the Fourth Volunteer Brigade. And it would later move to the Second Volunteer Brigade. 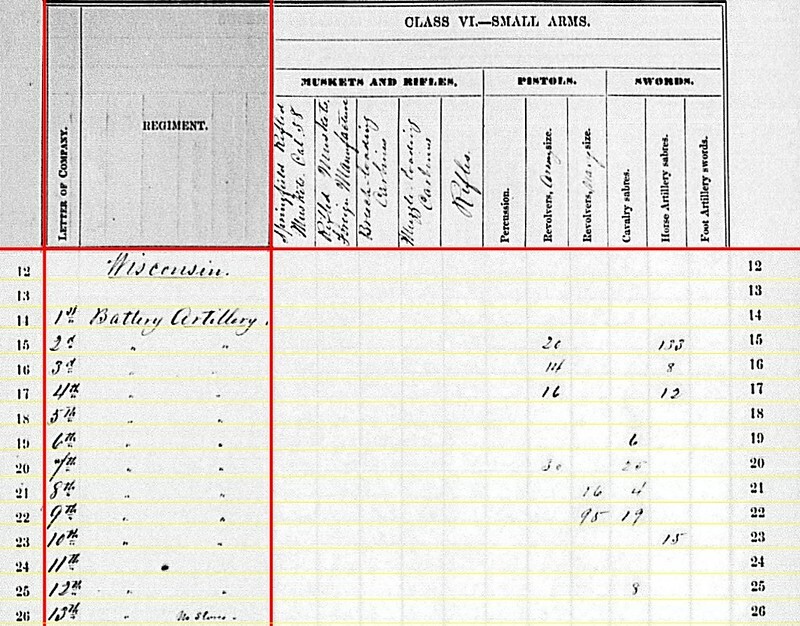 Battery D: Reporting at New Creek, (West) Virginia with six 3-inch Ordnance Rifles. Captain John Carlin’s battery was part of Mulligan’s Brigade, Department of West Virginia. Recall this battery spiked and abandoned its guns with the retreat from 2nd Winchester. Just a few weeks later, the battery was re-equipped and in the field. Battery E: Reporting at Mechanicsburg Gap, (West) Virginia with six 3-inch Ordnance Rifles. Under Captain Alexander C. Moore, this battery was part of Campbell’s Independent Brigade, Department of West Virginia. The battery is mentioned on interpretive markers at Fort Mill Ridge, overlooking the Mechanicsburg Gap. Battery F: At Camp Barry, D.C. with four 3-inch Ordnance Rifles. 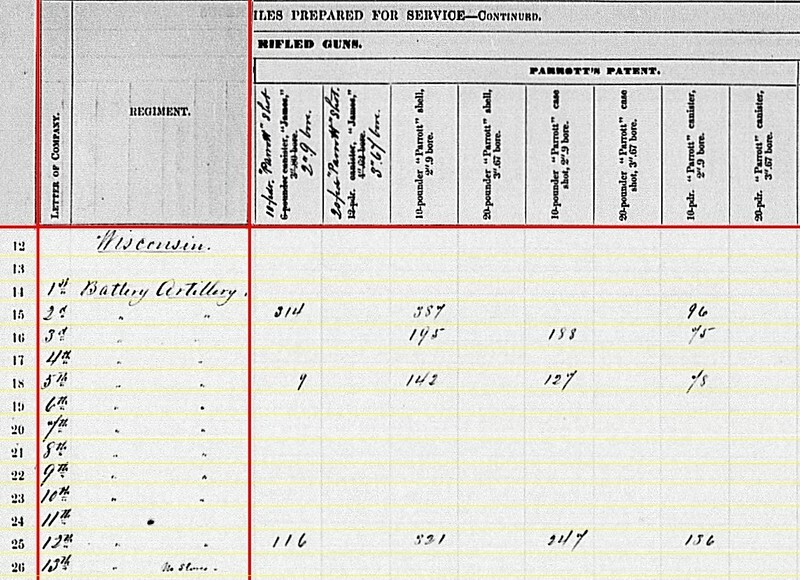 Recall this battery was caught up in the retreat from Martinsburg in June, losing all four guns (which were obviously replaced when they arrived at Camp Barry). Captain Thomas A. Maulsby, commanding the battery, was among the wounded. In his place, Lieutenant John S.S. Herr commanded through July. Herr became ill and relinquished command to Lieutenant James C. Means in August. Finally, in October, Lieutenant George W. Graham was promoted to battery captain. Again, note this battery was rapidly re-equipped after the disasters of June 1863. Battery G: Indicated at Martinsburg, (West) Virginia with two 6-pdr field guns and two 10-pdr Parrotts. Captain Chatham T. Ewing commanded this battery. But with Ewing wounded at White Sulphur Springs, West Virginia on August 26, Lieutenant Howard Morton stood in as commander. The battery supported Averell’s Separate Brigade, Department of West Virginia. Battery H: No return. Captain James H. Holmes was commissioned as commander of this battery in late September. The battery was still organizing through the fall. Battery A: 128 shot, 64 shell, 200 case, and 128 canister for 12-pdr Napoleons. Battery G: 300 case for 6-pdr field guns. Battery D: 120 canister, 18 percussion shell, 278 fuse shell, and 720 bullet shell for 3-inch rifles. Battery E: 226 canister, 395 percussion shell, and 1,303 fuse shell for 3-inch rifles. Battery F: 80 canister, 111 percussion shell, 370 fuse shell, and 252 bullet shell for 3-inch rifles. Yes, a lot of shells for Battery E as they protected their gap in the mountains. Battery B: 372 shell, 333 case, and 206 canister for 10-pdr Parrott. Battery C: 653 shell, 270 case, and 213 canister for 10-pdr Parrott. Battery G: 92 shell for 10-pdr Parrott. Battery C: 90 case for 10-pdr Parrott. Battery B: Eighteen navy revolvers and forty-four horse artillery sabers. Battery D: Sixteen army revolvers and five horse artillery sabers. Battery F: Thirteen army revolvers, six navy revolvers, and twenty-five cavalry sabers. Save for Battery H, which was still organizing, a rather complete record for the West Virginia batteries. We’ll look at the two sections reported in the infantry regiments next. For the previous quarter, we saw the clerks at the Ordnance Department had single line allocated for batteries formed from Tennessee volunteers. At that time, there were two light artillery batteries, formed from Tennessee unionists. Though others were forming up. And two regiments of heavy artillery were getting organized, being recruited from the contraband camps in west Tennessee. Battery A: This was the former 1st Middle Tennessee battery, commanded by Captain Ephraim P. Abbott. The battery was assigned to Third Division, Reserve Corps, Army of the Cumberland. The battery moved down from Murfreesboro to Chattanooga in September, arriving just after the battle of Chickamauga. Earlier in the summer, the battery reported two 6-pdr field guns and four 3.80-inch James rifles. Battery B: This was the 1st East Tennessee Battery, and had been commanded by Captain Robert C. Crawford. By the summer of 1863 it was assigned to the Fourth Division, District of Kentucky. This battery played a small part in Burnside’s East Tennessee Campaign. Captain James A. Childress commanded. The battery was on duty around the Cumberland Gap at the end of September. Battery C: Still being organized, this battery would not muster until early 1864. Captain Vincent Myers would command. Battery D: Likewise still organizing and not mustering until 1864. Captain David R. Young would command. Battery E: Assigned to the District of North Central Kentucky. Captain Henry C. Lloyd commanded this battery. This battery served at various posts – Bonneville, Camp Nelson, Flemmingsburg, Mt. Sterling, and Paris – through the spring of 1864. In addition to those listed, Batteries F, G, and K appear later in later organization tables. But at the close of the third quarter of 1863, those were not even planned. 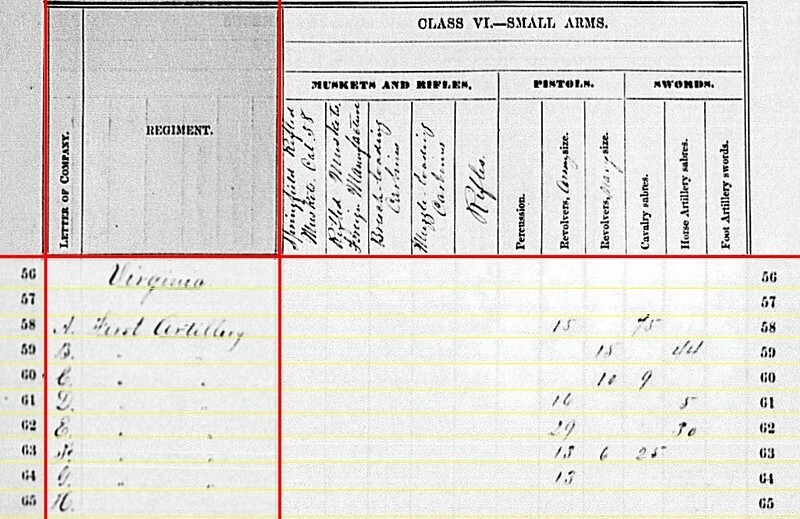 With no returns submitted, we have no cannon, ammunition, or even small arms to discuss in regard to these Tennessee artillerists. But the record is clear in that three batteries from the 1st Tennessee Light Artillery were mustered as of the end of September and were doing duty. But there are other batteries we should tally here. There actually was a fourth light battery, and possibly a fifth, that existed in the fall of 1863 and should mentioned here. In the “definitely” category is the Memphis Light Artillery. This battery is sometimes mentioned as the 1st Tennessee Battery, African Descent (or A.D.). Forming, starting the late summer of 1863, in Memphis and commanded by Captain Carl A. Lamberg (formerly of the 3rd Michigan Battery, which was then at Memphis), the battery’s official muster date was November 23. Later, in the following year, the battery would be re-designated as U.S.C.T. and assigned to the 2nd U.S. Colored Heavy Artillery as Battery F.
Hurlbut’s Battery consists of 2 James Rifled pieces and 2 smooth bore 6 pounders. Was in engagement at Bradley’s Landing, Ark., June 17,  about 18 miles from Memphis, Tenn., up the river. Fired about 60 shell with James Rifled pieces. Later in the summer, the battery appears on returns in the First Brigade, District of Memphis (along with the Memphis Light Artillery, for what it is worth). 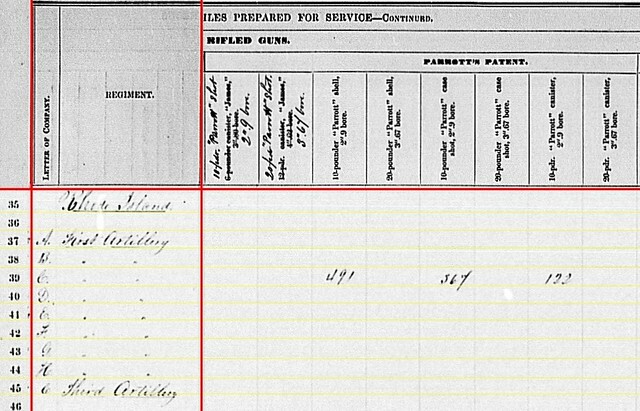 Lieutenant Albert Cudney commanded, from, apparently, Battery I, 1st Illinois Artillery. And the battery appears on Sixteenth Corps orders at the first of September. All of which still gives us little to go on. The battery, temporary as it was, certainly existed during the third quarter of 1863. And it saw action… at least sixty rounds worth of action. Though it was likely broken up shortly afterwards. As for its attribution to Tennessee, that is less certain. With only an index card heading to work from, evidence is thin. Rather, this temporary, improvised battery was likely made up of more Illinois or Indiana troops than Tennessee boys. 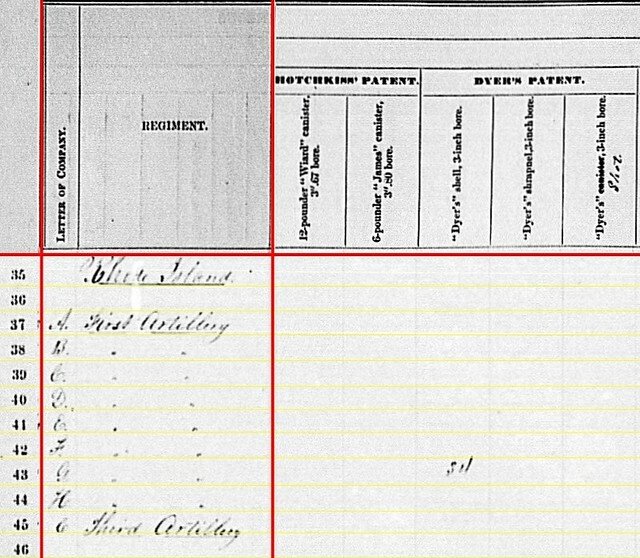 In summary, though the clerks did not have returns to work from, Tennessee had three batteries in Federal service at the end of September, one USCT battery forming, plus a couple more “unionist” batteries forming. And that’s why we have a heading for Tennessee in the third quarter, 1863 summaries. 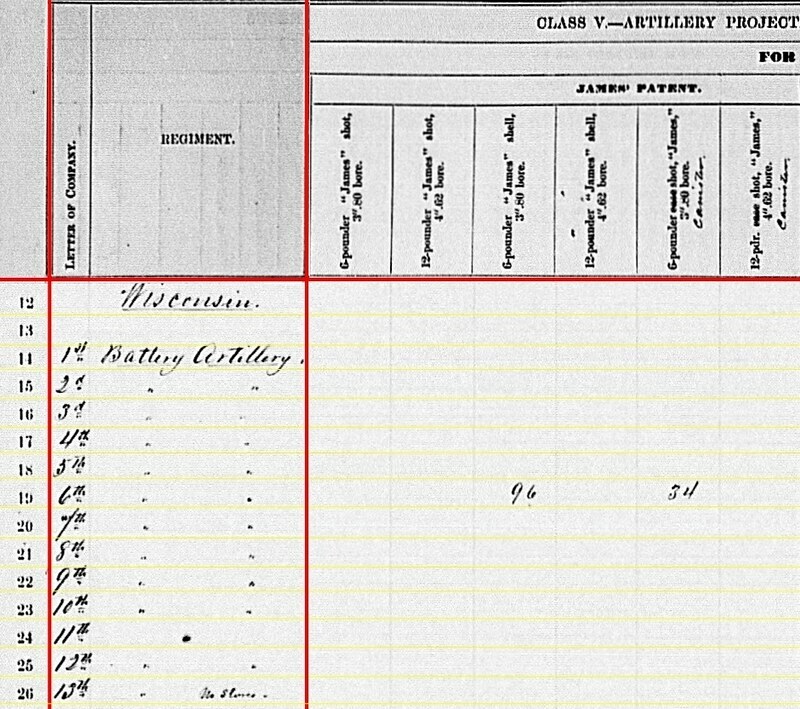 In the third quarter section for Pennsylvania, below the 3rd Pennsylvania Artillery listings, were a dozen lines which were sort of a “grab bag” of units of different origin or category. Some were independent batteries. Others were militia batteries only temporarily part of the Federal war effort. And lastly there was one artillery section reported in a cavalry regiment. Instead of breaking these up, which would lead to some splicing, we’ll look at these as one grouping and try to identify what was listed and what should have been listed by category. Battery A: See line 15. Sometimes known as Schaffer’s Battery. Or also going by, as in this case, the battery’s second commander – Captain Stanislaus Mlotkowski. And Mlotkowski’s Battery was posted to Fort Delaware, in the Middle Department, and serving as garrison artillery despite the light artillery title. Battery B: See line 23, Muehler’s Battery, but no return. This battery appears as the 26th Pennsylvania, assigned to Third Division, Twenty-first Corps, Army of the Cumberland. The battery brought four 6-pdr field guns and two 3.80-inch James Rifles into the fighting at Chickamuaga. The battery lost two 6-pdrs in some vicious, close fighting on September 19. Their position at the end of the day was near the Brotherton Cabin. Receiving two captured Confederate guns as replacements, the battery was back in action the next day. Part of Major John Mendenhall’s “last stand” on the afternoon of September 20, the battery only took guns off the field. Captain Stevens was mortally wounded in the battle, and replaced by Lieutenant Samuel M. McDowell. We can place the battery at Chattanooga for the end of the reporting period. Battery C: Thompson’s Battery appears on line 21. Shown at Brandy Station, Virginia, with five 3-inch Ordnance rifles. Captain James Thompson’s Battery was, at this time, consolidated with Battery F (below) and assigned to 1st Volunteer Brigade, Artillery Reserve, Army of the Potomac. Battery D: See line 16, this was Durell’s Battery. No return. Captain George W. Durell’s battery was part of the well traveled First Division (having moved from the Second Division), Ninth Corps. After the fall of Vicksburg, the battery participated in the siege of Jackson and then transferred to Kentucky with its parent formation. The battery remained on duty at Covington, Kentucky through the spring of 1864. Battery E: Line 20 is Knap’s Battery, but with no return. The battery was assigned to the Twelfth Corps. At the end of the reporting period, the battery was moving to Tennessee as part of the force sent to beleaguered Chattanooga. The battery had last reported five 10-pdr Parrotts on hand. Lieutenant Charles A. Atwell was promoted to captain and remained in command of the battery. however, his time was short. He would be killed the following month in the battle of Wauhatchie. Battery F: Hampton’s Battery combined with Battery C (above) at this stage of the war, and thus escaped mention on the summary. Captain Nathaniel Irish was the ranking officer on the rolls of the battery at this time. Battery G: Young’s Battery appears on line 22, at Fort Delaware with infantry stores. Captain John Jay Young remained in command. Battery H: See line 19. John I. Nevin’s Battery. Captain William Borrowe commanded at this time, thus the name Borrowe’s Battery appears on the summary. The battery was assigned to the Defenses of Washington, serving south of the Potomac. With a location indicated as “Camp Page” with six 12-pdr Napoleons. Battery I: This should be line 17. Captain Robert J. Nevin’s Battery was among those organized during the emergency of June 1863 as a six month battery. The location of Fort Washington, Pennsylvania places the battery outside Philadelphia, where it spent the summer in response to the draft riots. The battery had four 12-pdr Napoleons and two 3-inch Ordnance rifles. The battery would muster out in January, but then re-muster with most of the men re-enlisting. At that time it became Battery I. The Keystone Battery: See line 18. Captain Matthew Hastings commanded. Listed in Bate’s as a militia battery, the Keystone Battery was assigned to the Defenses of Washington in August 1862. In June 1863 the battery was at Camp Barry. Before mustering out in August 1863, the battery briefly served in the field with Third Corps. Their muster out date (August 20) might explain the lack of report in this summary. Frishmuth’s Battery: The Philadelphia Union Battery commanded by Benoni Frishmuth. Mustered on June 26 and discharged on August 1. Miller’s Battery: Philadelphia Howitzer Battery. Commanded by Captain E. Spencer Miller. Mustered June 19 and discharged July 25. Landis’ Battery: 1st Philadelphia Battery. Captain Henry D. Landis’ battery mustered on June 27, serving until discharged on July 30. Ermentrout’s Battery: Captain William C. Ermentrout’s was a company of heavy artillery. Mustered on July 3, and discharged on August 25, the company numbered five officers and 144 enlisted. The battery formed in Reading and saw service around Camp Curtain and Harrisburg. In some documents, this battery is called the Ringgold Artillery. And there are some individual connections between the battery under Ermentrout and the “First Defenders” battery of 1861. Such may explain the entry of “Ringgold Artillery” on line 24. Guss’s Battery: Chester County Artillery. Commanded by Captain George R. Guss. It mustered on July 3 and was discharged on August 25. Fitzki’s Battery: Second Keystone Battery with Captain Edward Fitzki in command. The battery mustered out on August 24. Woodward’s Battery: Captain William H. Woodward’s battery mustered on July 8. Unlike these other batteries, Woodward’s was not mustered out until November 4, 1863. The battery served at Philadelphia through most of its time. Tyler’s Battery: The Park Battery and carried on line 25. Captain Horatio K. Tyler, who’d served earlier in the war with an infantry regiment, commanded this battery. Mustered on July 16, the battery consisted of four officers and 138 enlisted. In late August, the battery was in Colonel James Mulligan’s Brigade serving in West Virginia. We have a location of Fort Fuller, Virginia, with one 3-inch Ordnance rifle and two 12-pdr James rifles (yes, a couple of old 12-pdr “heavy” field gun that had been rifled). But this battery, as we will see, carried a lot of ammunition for 3.80-inch and 3.67-inch rifles, along with that for 12-pdr Napoleons. The battery remained in service until January 28, 1864. Robert Nevin’s Battery: See Battery I, Pennsylvania Light (Robert J. Nevin’s Battery) above. 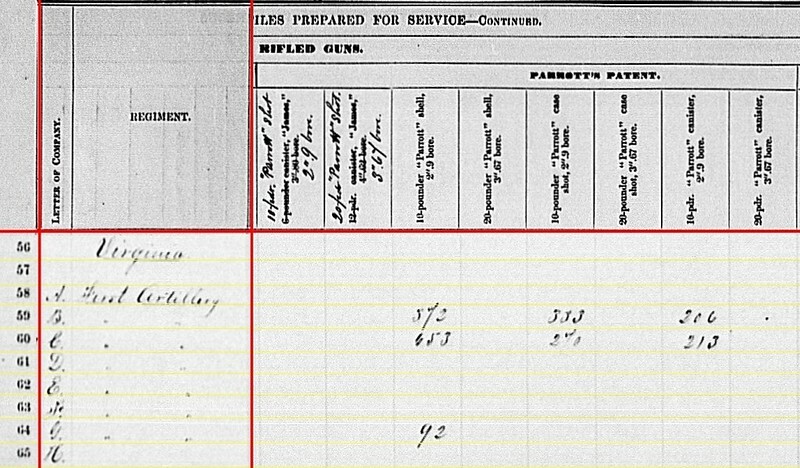 11th Pennsylvania Cavalry – The line read “Col. 11th Cav. Stores in charge.” And among those stores were two 12-pdr mountain howitzers. The 11th was assigned to the Seventh Corps, Department of Virginia and spent an active spring with detachments posted around the Suffolk and Norfolk area. Colonel Samuel P. Spear commanded. The regimental history has passing mention of “our” howitzers, but no specifics. 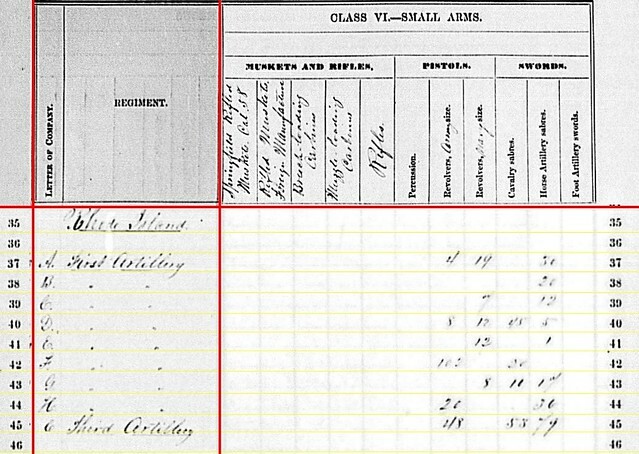 Sergeant Stewart B. Shannon, of Company I, is mentioned in relation to the howitzers. Line 24 – Ringgold Battery, perhaps Ermentrout’s Battery? Battery I / Robert J. Nevin’s Battery: 192 shot, 64 shell, 192 case, and 64 canister for 12-pdr Napoleons. Battery H / Borrowe’s Battery: 296 shot, 112 shell, 299 case, and 100 canister for 12-pdr Napoleons. The Park Battery / Tyler’s Battery: 70 shot, 518 case, and 252 canister for 6-pdr field guns; 662 shot, 363 case, and 653 canister for 12-pdr Napoleons. Clearly some explanation is needed here… but I have little to offer but speculations. 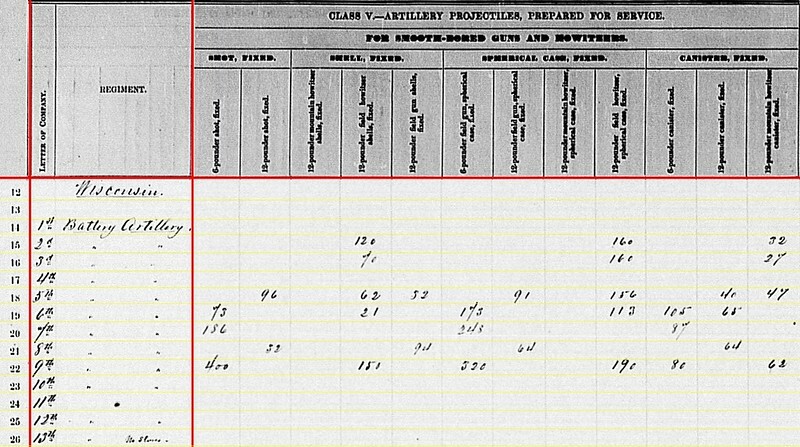 11th Pennsylvania Cavalry: 64 shell, 141 case, and 48 canister for 12-pdr mountain howitzers. Battery I / Robert J. Nevin’s Battery: 100 canister and 200 bullet shell for 3-inch rifles. Batteries C & F / Thompson’s Battery: 130 canister 299 fuse shell, and 322 bullet shell for 3-inch rifles. The Park Battery / Tyler’s Battery: 33 canister, 209 percussion shell, 292 fuse shell, and 129 bullet shell for 3-inch rifles; ALSO 6 percussion shell for 12-pdr/3.67-inch rifles. Again, this defies a proper reconciliation. 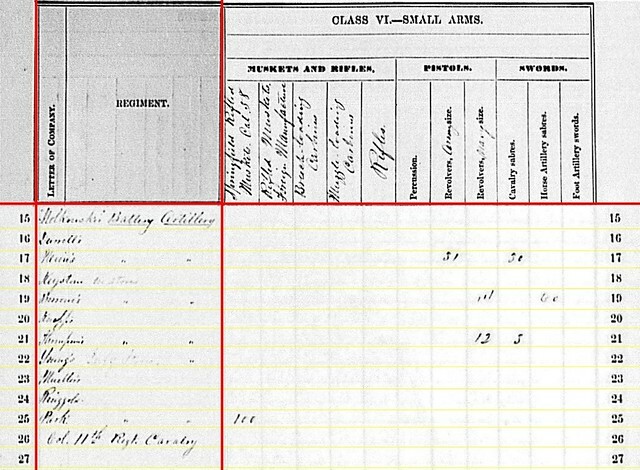 The Park Battery / Tyler’s Battery: 98 James patent shot for 3.80-inch rifles. Battery I / Robert J. Nevin’s Battery: 100 case for 3-inch rifles. Batteries C & F / Thompson’s Battery: 135 shell and 120 case for 3-inch rifles. The Park Battery / Tyler’s Battery: 24 shell for 3.67-inch rifles. So right down the line, it is the short-serving Park Battery that leaves us with the most questions. Seems every entry line for that battery offers contradictions. Perhaps they just received anything available and were stuck with maintaining stores left behind by other batteries. Or perhaps the summary was just not properly constructed, and thus lead to confusion at the Ordnance Department. Or perhaps we see again the clerks at that department were not infallible. Battery I / Robert J. Nevin’s Battery: Thirty-one army revolvers and thirty cavalry sabers. Battery H / Borrowe’s Battery: Fourteen navy revolvers and sixty horse artillery sabers. Batteries C & F / Thompson’s Battery: Twelve navy revolves and three cavalry sabers. The Park Battery / Tyler’s Battery: One hundred Springfield rifled muskets, caliber .58. That brings us to a close on this lengthy examination of the “other” batteries and sections from Pennsylvania. There are some questions we have unresolved, but on a whole this quarter was a better accounting than the previous.